MMA Titan – MMA News, Updates and Information » LIVE! UFC 236 Results & Play-By-Play! 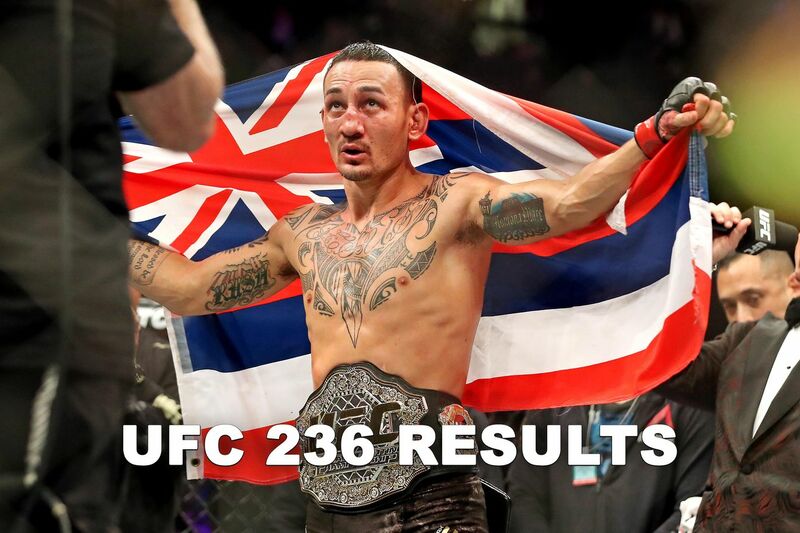 Ultimate Fighting Championship (UFC) is back in “The Peach State” this weekend for UFC 236: “Holloway vs. Poirier 2” pay-per-view (PPV) event, which is set to go down TONIGHT (Sat., April 13, 2019) inside State Farm Arena in Atlanta, Ga., featuring a lightweight interim title fight main event between featherweight kingpin Max Holloway and top 155-pound contender Dustin Poirier. “Blessed” was submitted by “The Diamond” back in 2012 and a victory this weekend not only avenges that loss, it also puts Holloway (or Poirier) into a Khabib Nurmagomedov title unification bout this fall. In the UFC 236 interim championship co-headliner, middleweight bruiser Kelvin Gastelum collides with 185-pound striking sensation Israel Adesanya for the substitute strap. The winner moves on to battle reigning division champion, Robert Whittaker, just as soon as “The Reaper” heals up from surgery later this year. Remember, you MUST have a subscription to ESPN+ to order the UFC 236 PPV, so use THIS LINK to sign up for your seven-day free trial! MMAmania.com will deliver LIVE round-by-round, blow-by-blow coverage of the entire UFC 236 fight card below, starting with the Fight Pass “Prelims” matches online, which are scheduled to begin at 6:15 p.m. ET, then the remaining undercard balance on ESPN at 8 p.m. ET, before the ESPN+ PPV main card start time at 10 p.m. ET. Round 1: Jouban gets double underhooks, can’t get him all the way down. Tries a head kick on the break. Grant swings big on the fence. eats an elbow on the break. Things slow down in the center. Grant overextends on a left hook. Body kick from Jouban. Grant low kick. Two minutes in. Overhand right falls short. Huge counter 3-2 from Grant. Two minutes to go. Low kick lands for Jouban. Grant whiffs on a right hook. Good lead hook. Jouban eats a low kick, tries a head kick. One minute to go. 1-2-3 from Jouban, who’s now pressing the issue. 10-9 Grant in a slower round than expected. Round 2: Low kick from Grant, who tries some manner of kick. Clubbing shots land for him. Low kick exchange. Lead left from Jouban. Leg kick exchange a minute in. Jouban lands a jab. Two low kicks from Grant two minutes in. Jouban tries a head kick. More low kicks from both men. Counter right by Grant. Two minutes to go. Grant leg kick. Jouban whiffs on a right hook. He catches a kick and ties up on the fence. They separate with a minute to go. They trade low kicks. 10-9 Grant. Round 3: Uppercut and straight right from Grant after some prolonged staring. Jouban whiffs on a three-piece. One minute in. Grant fires a trio of counters capped by an uppercut. Head kick attempt. Grant tries a high kick, lands an uppercut two minutes in. Grant takes a shot to the nards. Low kicks from Grant when they resume. Jouban hasn’t landed a clean punch in ages. Two minutes to go. Right hook finally connects for Jouban. Leg kick. Grant lands one of his own. One minute to go. Jouban tries a wheel kick. Grant digs a left downstairs, Jouban jumps directly onto his back from a takedown and ends the round punching. 10-9 Jouban, I guess. Round 1: Krylov lands an early body kick and straight right. Low kick and right hand knock OSP back. OSP ties up and scores a takedown on the fence. Krylov gets to his feet and looks for a guillotine. One minute in. Krylov still looking for it. 10-finger, looks like. He loses it but lands a knee. Outside trip lands for OSP two minutes in. Krylov pops back up. Krylov gets a body lock, tries a takedown but OSP’s whizzer lets him counter into guard. Two minutes to go. OSP works his way to mount and lands a hard elbow. Krylov escapes out the back door and lands well on the fence. One minute to go. Body kicks from Krylov. They tie up. Krylov puts him on the fence. He looks for a head kick on the break. 10-9 Saint Preux. Round 2: Low kick and body kick from Krylov, eats a pair of counters. Head kick attempt. Hard 1-2 prompts OSP to shoot. Looks for a single-leg, eats a few elbows. One minute in. Krylov defends a takedown, looks for his own and dumps him to the mat. He hops right into mount and takes the back. Elbows from Krylov. Two minutes in. He wraps up the RNC, can’t get it under the chin. Now he gets it and there’s the tap. Round 1: Frevola pops him with a right hand, but walks into a knee that dings him. Frevola powers through for a takedown into side control. Frevola spins to the back. Good control as Turner tries to scramble. One minute in. Both hooks in. Left hands from Frevola, but Turner escapes and lands some hard left hands inside before limp-legging out two minutes in. Big right hook hurts Frevola, who shoots and gets stuffed. Counter 1-2 off a Frevola low kick. Again and it buzzes Frevola. Frevola shoots, avoids a guillotine. Two minutes to go. A failed sweep allows Frevola to get to side control. Frevola cranks on a guillotine, sweeping into mount. Frevola loses it and Turner uses the cage to roll free. Good punches from the front headlock by Turned. Back to their feet with a minute to go. Turner lands a 1-2 and sprawls. Frevola connects before the bell. 10-9 Turner. Round 2: 1-2 from Turner. Frevola shoots on the cage, denied via underhook. Frevola body kick. Frevola gets in deep on a takedown, but Turner limp-legs out a minute in. Frevola leg kick. 1-2, left hook. Two minutes in. Frevola leg kick met by a jab. Jabs from Frevola. Frevola shoots, stuffed. Right hook inside from Turner. Two minutes to go. Doubel right from Turner. Wheeel kick attempt. Counter knee by Turner and he snaps up a guillotine as Turner shoots. Loses it, still in the front headlock. One minute to go. Frevola still driving, lands on top in half guard. Frevola looks for a guillotine, loses top position. Frevola lands an illegal upkick that puts a heel in Turner’s eye. No loss of point. 10-9 Frevola. Round 3: Turner looks for a combo. Body kick and straight left. They trade near the center. One minute in. Turner blasts him with a hard four-piece. Left upper on the fence. Two minutes in. Frevola completes a takedown into guard. Turner looks for a triangle, loes it and gives up half guard. Side control. Two minutes to go. Turner doing nothing to stand. Now he gets an underhook, stands, and blasts Frevola with a knee. Frevola shoots, shoved away. Body kicks from Turner. One minute to go. Spinning back kick from Turner. Counter overhand by Frevola. Good right hand. Turner rips the body in return. Right cross on the fence. Another. Frevola with a last-second takedown. 10-9 Turner. Round 1: Pantoja counters a low kick with a right hand. Reis tries a body kick, blocks a head kick. One minute in. Pantoja tries a knee. Reis shoots on the fence. Trip nearly gets Pantoja down, but does not. Good takedown, spinning him off the fence two minutes in. Pantoja makes it to his feet and separates. 1-2 floors Reis in the center. Pantoja looking to pound him out, does so. Round 1: 2-3 from Griffin right off the bat. Griffin drags him down into side control and looks for the back. Imadaev grabbing the fence relentlessly, loses a point for it. They restart on the feet for some reason. Imadaev lands a knee to the body and denies a takedown for a moment, but Griffin perseveres. One minute in. Griffin looking for a no-hook RNC. He goes palm-to-palm and looks to crank. Loses it. Two minutes in. Imadaev stuck on one knee as Griffin continues to look for the choke. Imadaev grabs the fence to escape a crank. Low kick from Imadaev when they restart, checked. Two minutes to go. Spinning elbow from Imadaev and he tries a wheel kick, but eats a pair of stiff jabs. Another one. Griffin ducks another spinning elbow. Imadaev reverses position on the fence. One minute to go. Knees from Imadaev. Griffin gets underhooks and they trade knees. hard left hook on the break from Imadaev. 10-8 Griffin with the point deduction. Round 2: Griffin with an early takedown when Imadaev tries to spin. Imadaev gets up, Griffin still attached. Imadaev puts him on the fence. They trade on teh break. One minute in. Nice granby roll by Imadaev. Jab exchange. Uppercut by Imadaev. Griffin lands a lead right and Imadaev taunts him. Low kick by Imadaev. Griffin landing his jab. Both whiff on rights but Griffin lands a takedown two minutes in. Imadaev pops up and puts him on the fence. He tries to spin and Griffin reverses position. Another reversal. Two minutes to go. Imadaev tries a head kick, appears to want a tornado kick and gets taken down for it. Knee lands for him as he stands. Knees from Griffin and they separate. Trading jabs. Big straight right hurts Griffin. Left hook lands. Griffin ducks a spin, eats an uppercut. One minute to go. They separate. Griffin tries another takedown, Imadaev looks for a flying knee. Right hand, clinch knee. Body kick, left hook, knee to the head. Spinning elbow. 10-9 Imadaev. Round 3: Both look fatigued. Griffin moreso. Imadaev on the advance, eats a right hand. Body kick from Griffin. Lead right. Big uppercut from Imadaev, who walks into a right hand. One minute in. Sweeping hook by Imadaev and a jumping knee after a clinch. Griffin leg kick. Straight right by Imadaev. Imadaev lands a nasty series of right hands and ties up. two minutes in. Griffin with a right hand on teh break. Jab exchange. Brutal left hook from Imadaev, Griffin lands a right cross in return. Griffin with a pair of rights, hits a takedown on a couple tries but Imadaev stands. Two minutes to go. Imadaev looks for his own takedown. Griffin denies with an underhook and drills the body with a pair of knees. Griffin pressing him against the fence. Imadaev reverses. Knees from Griffin. Big right hand from Griffin as they trade. Griffin tries to spin, gets rocked, and they slug it out. 10-9 Imadaev. Round 1: Taha floors Salmon with a 2-3 in the opening seconds and proceeds to pound him out. Salmon protesting but he was in bad shape. Round 1: Millender tries to open with a flying knee and head kick. Low kick lands. Left hook from Muhammad. One minute in. Leg kick from Millender answered by a left hook. Jab counter this time. 1-3 and a body shot from Muhammad. Millender pops him with a jab in return. Two minutes in. Millender lands a body shot. Jab exchange. Lead hook by Muhammad. Oblique kick from Millender and Muhammad shoots. Two minutes to go. Short knees from Muhammad. He changes levels, transitions to a single-leg, can’t get him down. One minute to go. Muhammad takes an eye poke on the break. Good jab from Millender. More landing. 2-3 lands clean. Millender threatens a takedown, lands a body kick. 10-9 Millender. Round 2: Muhammad marches into the clinch; he apparently lost a contact after that eye poke, which may explain why Millender had so much success at the end of the round. Muhammad looks for a single-leg. Elbow lands on the break a minute in. 1-2 and lead hook by Muhammad. Millender oblique kick and right hand met by a jab. They trade lefts, then rights. Two minutes in. counter right from Millender. Muhammad with another lead hook. Muhammad shoots, dumps Millender into half guard. Two minutes to go. Muhammad landing elbows and short punches. One minute to go. Millender regains guard. Muhammad staying busy. Nice elbows. 10-9 Muhammad. Round 3: Good leg kicks from Millender. Muhammad shoots, stuffed, eats a knee. Millender leg kick, Muhammad jab. Left hook from Muhammad. Overhand right. Heavy left hook and another overhand right into a double leg a minute in. Muhammad on top in half guard. Chipping away with punches. Two minutes in. More patient ground-and-pound. Full mount with two minutes to go. Millender regains half guard. Muhammad works his way back to side control. Full mount again with a nasty elbow. Two more and Millender gives up his back. Muhammad loses a hook, keeps punching and denies an attempt to stand. Millender makes it to his feet in the final seconds. 10-9 Muhammad. Round 1: They trade low kicks to start. 1-2 from Jackson, tries a head kick. Soukhamthath low kick met by a straight left. One minute in. Body kick from Jackson. 1-2. Soukhamthath answers a jab with a 1-2. Soukhamthath catches a body kick, kicks the other leg. Two minutes in. Jackson jabs. Soukhamthath tries to rush. Low kick. Two minutes to go. Both try body kicks and low kicks immediately after. Soukhamthath lands a lead right and knee downstairs. 1-2-1 from Jackson and he shoots, hitting a lovely high crotch into half guard. One minute to go. Soukhamthath gets to his feet, Jackson still attached. Another takedown into side control. 10-9 Jackson. Round 2: Picking at each other at range in the center. Superman punch from Soukhamthath. Soukhamthath with a right hand downstairs answered by a knee from Jackson. one minute in. Body kick exchange. Jackson catches a low kick, lands one of his own. Jabs from Jackson still landing. Both land leg kicks. Jackson ties up, lands a knee and puts him on the fence. Hard left hand on the break. Straight left in the center. Jackson tries a foot sweep, then unloads on Soukhamthath against the fence. Two minutes to go. More combinations from Jackson. Huge right hand. Soukhamthath throwing back. Jackson ties up, lands a knee to the body. Outside trip into full guard. Jackson lands some short punches until the bell. 10-9 Jackson. Round 3: Straight left early from Jackson alongside the jabs. Soukhamthath takes a kick to the nuts/gooch area when both throw at the same time. Soukhamthath takes some time to recover and hits a takedown of his own, only to get swept nearly into mount. Jackson landing hard punches from quarter guard. One minute in. Soukhamthath regains half guard. Sneaky right hands from Jackson. Two minutes in. Jackson looks to pin Soukhamthath’s hand behind him, then looks for a kimura. Loses it, but lands some body punches. Soukhamthath regains guard. Two minutes to go. Jackson focused on keeping a hand pinned, landing short shots. One minute to go. Soukhamthath tosses up an armbar, then a triangle, and gets slammed for his trouble. Jackson passes to side control. and lands some elbows. 10-9 Jackson. Round 1: Mueller on the advance, pumping 1-2s as Botelho fires low kicks. Botelho leg kick and spinning back kick attempt. Counter right by Mueller a minute in. Heavy body kick from Botelho and she looks to press the advantage. Puts Mueller on the fence, takes her down into half guard. Two minutes in. Short shots from Botelho, not posturing at all. Mueller regains guard. Sweep attempt denied. Botelho lands as Mueller looks for a deep half guard sweep. Two minutes to go. Botelho lands a knee as Mueller stands. Mueller puts her on the fence in return. Botelho reverses. One minute to go. Foot stomps from Botelho. Elbow exchange. 10-9 Botelho. Round 2: Mueller back on the advance with punches. Low kick from Botelho. Spinning back kick misses. Combinations from Mueller, puts Botelho on the fence. Trading knees. One minute in. Botelho reverses, lands knees, gets reversed in turn. Mueller tries a throw, denied. Nasty elbow by Mueller met by one from Botelho. Botelho hits a double-leg into guard two minutes in. Mueller trying to use a butterfly hook. Two minutes to go. Mueller works her way to her feet. Puts Botelho on the fence. Botelho reverses. One minute to go. Ref separates them. Botelho throws another spinning kick, eats a right hand. Mueller body kick. Leg kick, denies a takedown. Good late surge from Mueller. 10-9 Botelho. Round 3: Botelho opens with low kicks. Punch exchange. Teep from Mueller. Botelho tries a wheel kick, eats punches and puts her on the fence. One minute in. Mueller reverses. Not much from either woman. Knees from Botelho and she reverses. Two minutes in. Ref separates them. Right hand from Mueller counters a knee. Jab exchange. Botelho shoots, denied. Botelho gets her against the fence. Two minutes to go. Ref splits them up quick. Low kick by Botelho, who looks really tired. Knee from Mueller. Botelho left hook, gets blasted by a 1-2-3 and a knee. Mueller on the attack. Front kick, denied takedown. Botelho slips with a minute to go and Mueller follows her into guard. Mueller passes to half guard and looks for elbows. 10-9 Mueller. Round 1: Costa clips Davis with a right hand and tries to pursue. Davis waving him on. Hard right hand sends Costa into retreat and Davis ties up on the cage. One minute in. They separate. Low kick from Costa, who blasts Davis with an overhand right and head kick. Davis again waves him on, lands a 2-1. Check hook by Costa and he puts Davis on the cage. Davis denies a takedown and reverses. Costa lands a knee and a jab after separating. Uppercut downstairs. Davis counters a low kick with a straight right. Three-piece from Davis. Huge 3-2 by Costa. Davis leg kick, eats an overhand right. Jab exchange. Two minutes to go. Davis lands some leg kicks. Costa lands a series of jabs and an overhand right on the cage. Clean left head kick that Davis shrugs off. One minute to go. Costa body kick, Davis low kick. Jab wobbles Costa and they clinch up. Jockeying for position. Knee from Davis, looks for an elbow on the break. Davis on the advance, lands a combination. 10-9 Costa. Round 2: Right hand stuns Davis and Costa is on the attack. Davis ties up, pressed against the fence. As soon as they break, Davis unloads a long string of combinations until Costa shoots. One minute in. Davis sprawls on him, transitions to the back, and locks up a no-hooks RNC for the tap.